Whether you’ve been going to therapy for years, or you’re going to therapy for the first time, a good therapist is essential. Unfortunately, many people have one bad experience with a therapist and they stop going. If you are adamant about getting the help that you need, it may take some time to find the right therapist for your needs. In today’s post, we will give you a few tips to help you find a therapist that is right for you. If you are in Toronto and you’re in need of a psychologist that you can trust, Dr. Eliana Cohen can help. At Dr. Eliana Cohen Psychology, we specialize in a variety of therapy and counseling services, including couples counseling, family counseling, and therapy for mental health issues such as depression and anxiety. If you’re looking for a team of psychologists that can help you live the best life that you can, browse our website to learn more about what Dr. Eliana Cohen Psychology has to offer, and contact us today to schedule an appointment. Before you search for a therapist in your area, it’s a good idea to consider whether you would consider talking to a woman or talking to a man. Most people typically have a preference for speaking to a man or a woman. Some people have a strong preference, while others may be indifferent, but what matters is how you feel. Knowing what gender you feel most comfortable talking to is an important first step to finding a therapist that you like. It’s important to do some research when searching for a therapist. As you conduct your research, not only are you searching for a therapist that has all the qualifications and characteristics that you need, you are also researching the different types of therapy that are offered. If you have friends or family members that have gone to therapy, ask them for recommendations. They will be able to tell you what they did or didn’t like about certain therapists, hopefully giving you an idea of a few therapists to schedule an appointment within the area. During the research process, one thing you should look for is a therapist’s experience and credentials. Most therapists that you find online should have a website that lists the therapist’s specialties, years of experience, and certification. 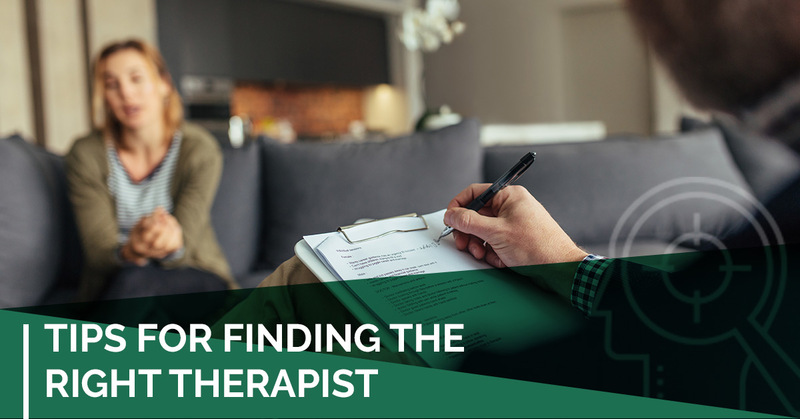 While there is nothing that says an inexperienced therapist isn’t good at their job, it’s typically a good idea to look for a therapist that has at least a few years of experience. In addition to experience, you will also want to look to see if a therapist specializes in the type of therapy or counseling that you wish to receive. For example, if you’re looking for help with depression or anxiety, you wouldn’t want to go to a therapist that specializes in anorexia or couple’s counseling. If you find a therapist that looks good on paper, schedule an appointment. Before you commit to a therapist, it’s a good idea to go to a couple of sessions to see if there is a connection. During the first appointment, it’s okay if you don’t feel like opening up right away, but you want to make sure you feel comfortable with your therapist. If you don’t have a connection with your therapist, it can make it difficult to open up and talk about your feelings. That being said, you may want to see if a therapist that you are interested in offers a consultation, allowing you to ask questions and get to know the therapist before committing to multiple sessions. At Dr. Eliana Cohen Psychology, we are dedicated to helping you solve your problems. Whether you’re looking for mental health therapy or couples and family counseling, the associates at Dr. Eliana Cohen Psychology offer a variety of therapy and counseling services. To learn more about what we have to offer or to schedule an appointment, contact Dr. Eliana Cohen Psychology today!